Long before a group of gourmet purveyors began staking claim to what is now a blossoming culinary corner of Ridgefield known as the Marketplace at Copps Hill, Southwest Cafe has been roasting, grinding and blending red and green chilies into dishes that serve as the cornerstone of its New Mexican cuisine. Just over twenty years ago Barbara Nevins opened Southwest Cafe inspired by a life in New Mexico and a love for its cuisine largely defined by the chile. Toss any notion of that green grocery store bell pepper out of your mind. A chile in the New Mexican sense is a nuanced creature with multiple personalities that restaurants such as Southwest Cafe exploit to their fullest and many New Mexicans trade as currency. First, a chile digression. Red and green chile sauce form the basis for much of New Mexican cuisine and the menu for Southwest Cafe, and are made from the same type of chilies. Green chilies are picked fresh and used promptly or frozen for later use. If the chilies are left to ripen to a deep red hue, they are picked and then hung to dry as ristras, strings of drying chilies, in order to be ground into a powder and later reconstituted into a red chile sauce. Whether you grow, roast or grind your own, you can always find someone who can do it for you in New Mexico or like Southwest Cafe, you can have your several hundred or so pounds shipped to you during chile season. Barbara orders approximately 900 lbs of green chilies each year from Robert and Terry Berridge of Berridge Farms outside of Hatch, NM each August and roasts them at the restaurant and orders her red chile powder from Chimayo, NM. Both green and red chilies are embedded throughout Southwest Cafe menu, which is broken up into small plates, big plates and New Mexican favorites as well as daily specials. On a recent visit clearly influenced by Barbara’s stories of her annual chile harvest visits and shipments, three hungry souls leaned heavily toward New Mexican dishes. We began with quesadillas and chile rellenos, steeling my expectations for the quesadillas and waiting excitedly for chilies, still unsure of what to expect as I embraced this side of the border. A spinach, mushroom and jack cheese quesadilla was wrapped in whole wheat flour and grilled until the cheese melted, nicely melding the smoky flavors. Southwest Cafe claims the chicken and mango quesadilla as their best-seller, it’s cilantro pesto studded innards solidly affirming this. 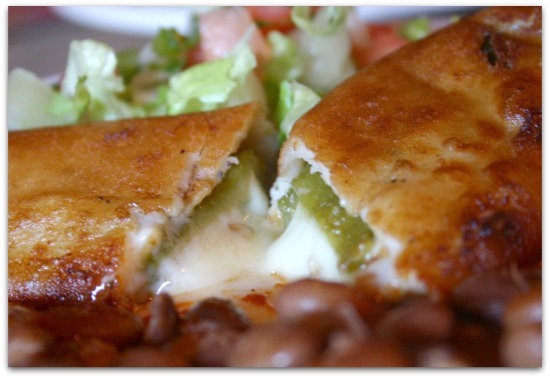 The "Christmas" chile rellenos came next, delivered to the table laying golden on their respective plates, one nestled into a bed of red chile sauce, the other in green. 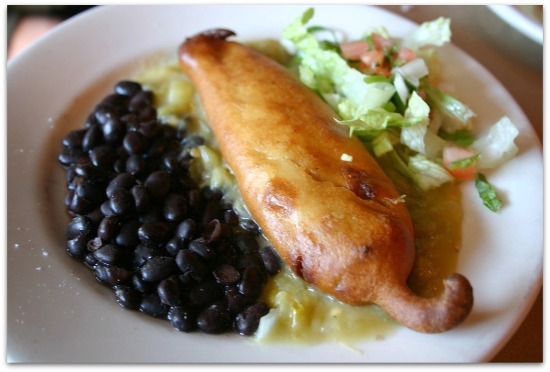 Batter fried and filled with molten jack cheese, the chile rellenos were easily the highlight of the afternoon. I enjoyed these together, red and green fraternal twins with distinctive personalities stealing our table's attention. The red chile sauce took the lead by a nose, with its nuanced smoky bite edging out the sweet heat from the green sauce. But just to be sure, I'm planning to try them all over again. We continued this dance from green to red chilies with a trio of entrees. 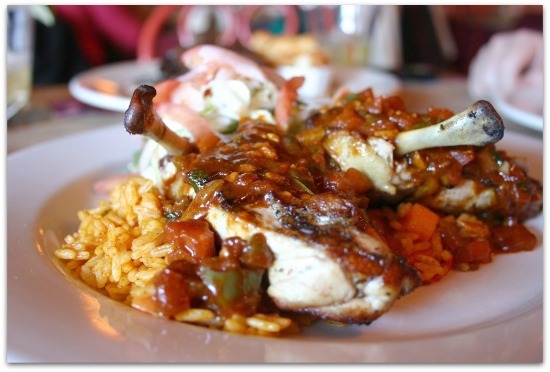 The Chicken Borracho is a moist bone-in chicken dish served with red chile and beer pan sauce. A colorfully composed dish with flavorful and moist meat, the savory chicken met its sweet match with a slathering of pickled tomatoes and vegetables atop rice. This is another Southwest Cafe best-seller with a smart harmony of sweet and savory. A Skirt Steak Asada was anchored by braised kale and onion, served with a side of chimichurri sauce that felt a bit rich at first but balanced well with the addition of the sauce. 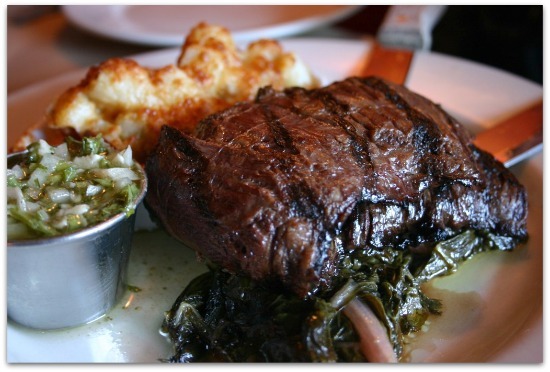 The steak is served with a crock of chipotle potato gratin that resembles bread pudding, thin and crispy crusts giving way to soft and airy cubes of potato. We ended with a rich green chile stew that featured huge shards of slow cooked chipotle pork pleasantly swimming a mixture of chilies and vegetables. The pork has the signature slow and smoky burn of chipotle which paired well with the sweet green chile base of the stew, a perfect New Mexican winter comfort food. I've eaten at Southwest Cafe a dozen or so times over the past ten years usually stopping at tacos and margaritas. Learn from my mistakes. Southwest Cafe may be one of the few places in Connecticut to get acquainted with New Mexican food and its celebration of the nuanced creature that is a New Mexican chile. Southwest Cafe is open 7 days a week and is located at 109 Danbury Road, Ridgefield. 203.431.3398.